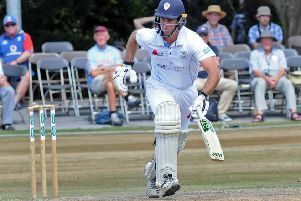 Daryn Smit said the number of extras given away from Derbyshire was an ‘embarrassment’ on day three of their Specsavers County Championship Division Two match at Durham. A below-par display in the field from Derbyshire saw them undo all their hard work from the first innings, when they bowled Durham out for 96, and leave the match in the balance going into day four. A total of 81 extras were conceded as Durham made 376 in their second effort, largely helped by an innings of 114 from Gareth Harte - his maiden first-class century, and left the visitors needing 268 to win the match. Reflecting on the third day, Smit said: “We obviously wanted to make early inroads. Picking up Cameron Steel, who we know could have played the anchor role and hang around although he was injured, was great. “Fair play to the rest of the tailenders, who supported Gareth Harte. Not just supporting him, but also scoring some vital runs. The bottom order showed some great character. “We bowled extremely well in the first innings to get them 96 all out. The wicket has obviously changed a fair bit, it’s perhaps not doing quite as much as what it did on the first morning. “By our standards and compared to the first innings we were poor with the ball today. I think Duanne still picking up five wickets was a great effort from him and he bowled with good aggression. “Unfortunately, he was not necessarily backed up at the other end. There wasn’t always pressure from both ends. To concede 81 extras is embarrassing if not is disgraceful at this level. “It was a mixture of short-pitch bowling and getting too greedy, bowling too straight and a lack of control when looking to go straight. There were a lot of no balls, it just wasn’t good enough. The home side looked down and out in the contest at 159-7 and a lead of only 50 at the start of day three after losing Cameron Steel in the second over. However, Harte battled with the tail to turn the tide. Matt Salisbury and Chris Rushworth took quick wickets to leave the visitors four down in the reply, although Ben Slater remains at the crease to give Derbyshire hope of one final momentum swing to turn the match back in their favour. Derbyshire need 203 runs for victory on the final day at Emirates Riverside. The home side began the day in dire need of a special innings, holding a lead of only 46 with four wickets remaining. Steel lasted only three balls into his day as he edged behind. Durham would have been fearful of a collapse, but Rimmington held firm alongside Harte at the crease. Harte and Rimmington had a to deal with a hostile spell of bowling from Duanne Olivier and Hardus Viljoen, which resulted in Harte receiving a blow to the head. However, he held his composure at the crease, while the accuracy of Derbyshire’s two South African bowlers failed them, allowing the extras total to build beyond 50 runs. Durham’s batsmen picked their moments to find the boundary, with Harte notching his maiden fifty in first-class cricket off 120 deliveries. Rimmington provided an excellent foil at the other end as the duo put on 100 for the eighth wicket to defy the visitors before lunch. The stand was broken just before the interval when Matt Critchley pinned Rimmington in front of his stumps for 42. Harte and Salisbury put forward a faultless effort to see off the threat of the new ball from Olivier and Viljoen, blunting the visitors’ attempt to regain their grip on the contest. Harte was fortunate in the nineties when an outside edge off Olivier just went wide of second slip. He knocked off the final two singles to secure his maiden ton off 218 deliveries. The partnership was ended on 99 when Salisbury was bowled by Olivier, who notched his fifth wicket and 10th in the match. Harte cut loose to add quick runs, but was the final wicket to foul to Wayne Madsen, leaving Derbyshire 268 runs to win following a costly day in the field, conceding 81 extras. The visitors were under pressure from the off as Salisbury struck to remove Billy Godleman, bursting through his defences. Madsen followed for a second-ball duck, receiving a vicious bouncer that offered a simple return catch to Salisbury. Rushworth piled on the agony with two wickets in two deliveries, removing Alex Hughes and Matt Critchley lbw. Slater was defiant late in the day to give Derbyshire a glimmer of hope of turning the contest back towards the visitors again. Smit added: “I think we have to look at the way they applied themselves in the middle and lower order. We have to try and emulate that - if not go better. “I think it’s so important having one batsman set and in the whole time. Gareth Harte showed that if you’ve got one batsman in at one end and has the feel of the wicket it allows everyone else to bat around him.